Strutt & Parker (Farms) Ltd have been doing what they do best for a very long time. Their families have been farming in Essex and Suffolk for over 200 years, and the company was incorporated in 1918. The business in 2017 includes four main arms over 20,000 acres, along with joint ventures and contracts, including Lavenham Fen Farms, a Cambridgeshire farming enterprise, and a sheep enterprise in Norfolk on Ministry of Defence land. They now also grow over 1000 acres of potatoes which they supply to all of the major supermarkets in the UK. Strutt and Parker have worked closely with Fork Truck Direct for eight years. Over that time, both companies have built an excellent working relationship, with Fork Truck Direct using their experience to provide the right equipment to Strutt & Parker (Farms) for a range of Farming applications. The forklift application is intense, loading 1-2ton potato boxes for as much as 80 hours a week per machine. It’s a tough job and a demanding schedule so the equipment used absolutely has to be reliable, efficient and durable. 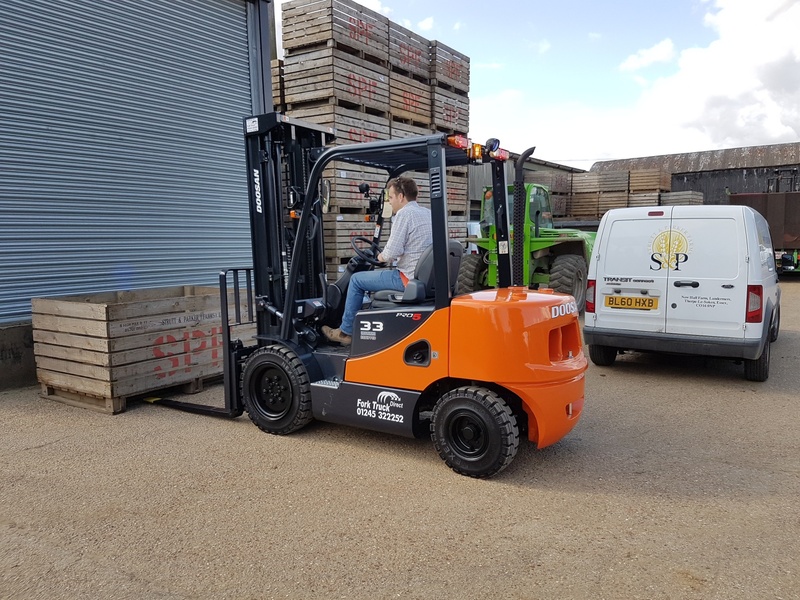 Currently, Strutt & Parker are using three Doosan D30S-5 diesel forklifts and one Doosan D33S-5 diesel forklift. On the recent delivery of their new Doosan D33S-5, Jim Mcnair, Assistant Farm Manager of Strutt & Parker, confirmed that he’d chosen the Doosan product for its outstanding reliability and FTD for their outstanding service and response. The forklifts are extremely durable so they can cope with heavy loads and a challenging time on the farm. Should something go wrong, the side cover and floor plate are tool-less, so service is easier and the forklifts can be back up and moving goods again quickly. Everything is designed to reduce downtime and lower maintenance costs, to keep loads moving and to keep produce as fresh as possible on delivery. Over the years, Fork Truck Direct have provided a wide range of high quality equipment to Strutt & Parker, and assisted quickly with repairs and services to ensure the farms keep running smoothly. We hope to continue working together for many more years to come.